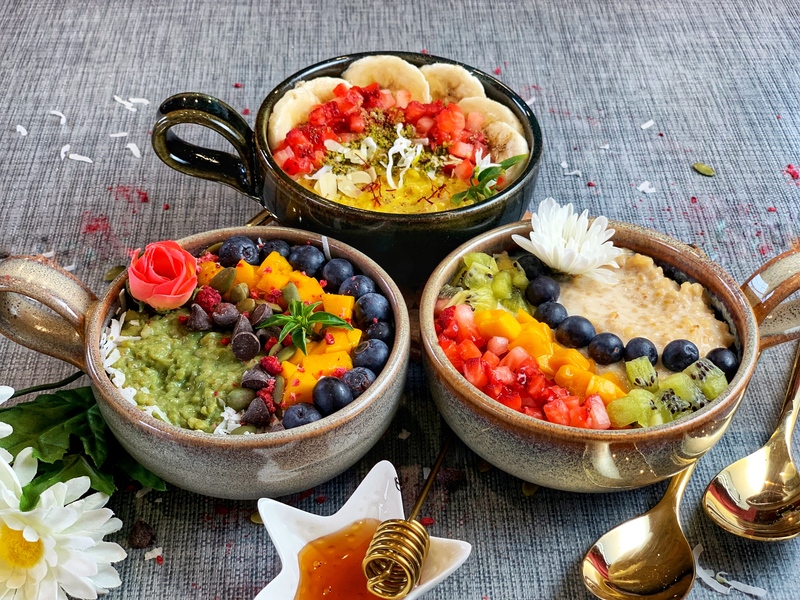 Packed full of antioxidants, vitamins, and probably the most aesthetically pleasing breakfast to look at, these cracked wheat smoothie bowls feature a super food twist! They look and taste just like smoothie bowls and even have the same fresh fruit and toppings, but they are extra healthy because of the yummy cracked wheat! The magic all starts with a quick, 15 mins in the Instant Pot that can be made the night before or in the morning, making it totally customizable to your schedule. Simply mix in your flavors, I used matcha, saffron-turmeric, and vanilla essence, and add your toppings! To really extract the most out of my breakfast, I usually add some fresh berries, in season fruits, dried coconut, and chia or hemp seeds. They’re a lovely blend of flavors and textures, perfect for that energizing start you need early in the morning! Perfect as a super healthy, super delicious breakfast, these cracked wheat smoothie bowls can also double as an easy snack! Flavor them any way you like and top them with some superfood toppings for the best breakfast you’ve ever tasted!! Packed full of antioxidants and vitamins, these cracked wheat smoothie bowls feature a super food twist! They look and taste just like smoothie bowls and even have the same fresh fruit and toppings, but they are extra healthy because of the yummy cracked wheat! Try it in three different flavors - Saffron-Turmeric, Vanilla and Matcha for a healthy, super delicious breakfast or as an easy snack! Switch the Instant Pot on sauté mode, adding the cracked wheat and let it roast until fragrant. Add in the water and salt and close the lid and cook on high pressure for 12 minutes. Make sure it is on natural release. Open the lid and stir the cracked wheat. Put it back on sauté mode and add the milk and jaggery. Cook for 5 minutes until it thickens. Divide it into three equal bowls and you’re ready to flavor. For the matcha bowl, use about 1 cup of the cracked wheat and soak the matcha powder in the warm milk for 5 mins. Stir it in and then top with the various toppings. For the saffron-turmeric bowl, use another one cup of cracked wheat and put the saffron/turmeric/nutmeg/cinnamon in warm milk for 5 minutes. Stir it in the cracked wheat and top with the various toppings. For the vanilla bowl, stir in some vanilla essence into another 1 cup of cracked wheat and top with the toppings. You can make the remaining cracked wheat into which ever flavor you like and enjoy a delicious start to your morning! For making the cracked wheat, roast it in the pressure cooker with ghee. Then add the water and salt and cook for 2 whistles. The first whistle should be on high flame and the second on medium heat. Switch off the gas and release the pressure. Open it up, add milk and jaggery and cook on medium heat for 5 minutes until it thickens. Then follow the above recipe starting with step 4. Any milk like soy or almond would work just as well here. Coconut oil works instead of ghee as they both give it a nice toasty flavor. You can use any toppings that you want with these different flavors! If you want to store the cracked wheat, just put it in the fridge once you open the Instant Pot (before you add the 2 cups milk). When you want to eat it, about 2-3 days later at most, just stir in the milk, sugar, flavor, and toppings. It can also be enjoyed hot or cold depending on your preferences. Quite an interesting and unique recipe and you have played it so well! Attractive!